Day 1/ You can arrive to the Galapagos only by flight, and only from either Quito or Guayaquil (air ticket not included). Our English speaking guide will be waiting for you at the airport in Baltra, who will then take you to the port of Puerto Ayora (Santa Cruz Island) for lunch. Afterwards, we will take the Public speedboat to Isabela (14:00), which lasts approximately two and a half hours. 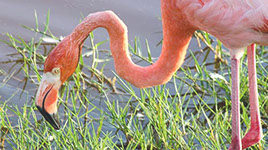 After arriving at Isabela, we will take a brief rest at the hotel and then head to the Flamingo Lagoon, which is the largest coastal lagoon found in the Galapagos and is one of the main reproductive sites for the majority of flamingos. Accommodation in the hotel selection of your choice. Day 2 Early in the morning (8:00 am), after breakfast, we will prepare ourselves for the Sierra Negra Volcano hike by putting on comfortable walking shoes and possibly a rain jacket, making sure our cameras are stored in waterproof bags, making sure to bring sunscreen, water, and hats, and finally by preparing our box lunch at the hotel to take with us. We will then travel approximately 45 minutes by truck or bus to begin the 12 km hike (appx. 3 hours). The hike is long in terms of distance, but not very difficult as the inclines and declines are quite gradual. There is an option to ride horses for an additional cost, and if interested please let us know beforehand. Sierra Negra Volcano has the second largest crater in the world, measuring approximately 6 miles in diameter and 300 feet deep. We will reach Volcan Chico before heading back, which should provide a spectacular view of the incredible moonlike terrain. Day 3 After breakfasts we will prepare ourselves for the visit to Tintoreras Islet, for which we will make our way to the dock of Puerto Villamil in order to embark on small speedboats that have a capacity of 12 passengers each. After a short ride (appx. 20 min.) we will arrive at Tintoreras Islet. The name of the islet derives from the sharks that live in the waters surrounding the islet that have whit-tipped fins, which are known as “Tintoreras”. 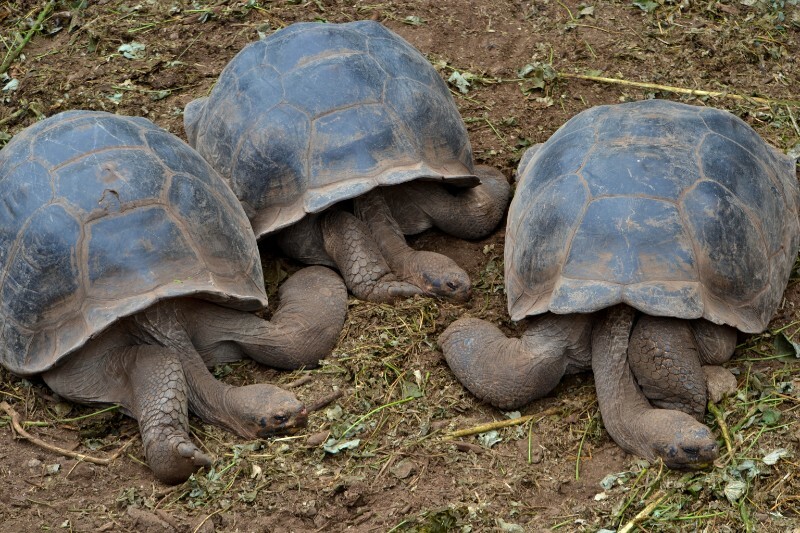 The islet is one of the most fascinating places on Isabela Island and in fact all of the Galapagos. 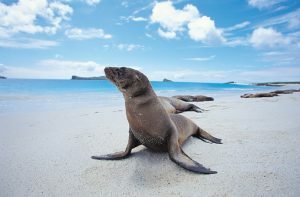 In this one area we can see sea lions, marine iguanas, blue-footed boobies, Sally Lightfoot Crabs, sea turtles, pelicans, and Galapagos Penguins. As the island is one of the main breeding sites for the marine iguanas, it is an excellent place to see numerous amounts of these creatures close-up. After the hike through the islet, we will get back on the boat and cool off by snorkeling in the waters nearby, where we can see multicolor fish, starfish, sea-urchins, and with luck manta rays, sharks, and sea lions that may swim with us close up. After this fascinating experience we will return to the hotel for lunch. Depending on the time of departure of the flight we will be able to visit two sunken “holes”, similar to craters, known as “Los Gemelos”. (For this reason we recommend booking your return flight for the afternoon). These craters were formed by the collapse of the earth beneath which lava had passed and created giant tunnels, which facilitated the collapse and creation of the craters. 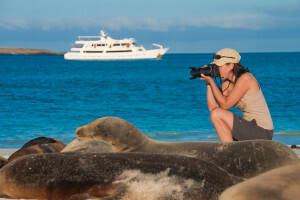 *Itinerary is subject to change without prior warning depending on seasonal changes, weather conditions, and adjustments in policies set by the Galapagos National Park, and other unforeseen circumstances that may arise. – HOTEL SELECTION: The hotel selection depends on the category of hotels that you choose. When you choose the class of hotels that you would prefer, we will indicate to you which hotels are available for the dates of your trip. -AIRFARE NOT INCLUDED: The price of the tour does not include air tickets. We can help with booking your ticket, or you may book your own flights on your own. PLEASE TAKE INTO ACCOUNT which island you will arrive and leave from, and if you choose to book your own flight please try to book your arrival in the morning (before 12am) and your departure in the afternoon (11am or after) so that you will not miss any part of the tour. You can book your flight through either TAME, AEROGAL, LAN, or TAME (recommended). -RESTAURANTS: We utilize local restaurants for breakfast, lunch, and dinner, which also depend on the category of hotel that is chosen, as not all hotels have restaurant services. Meals are served in the fashion of the local customs as “meal of the day” options; however, if you choose first class hotels you will have a dollar amount to spend on each meal. By patronizing local restaurants, we also contribute to the local economy, which helps maintain “sustainable tourism”. – GUIDES: We use local and different guides for each island you visit or sometime a guide that specializes in specific activities. The guides will accompany you throughout all excursions and visits, give explanations and education on their knowledge of the islands, flora, and fauna, and coordinate the activities each day. In reference to lunch and dinner, the guide will only indicate the restaurant selected but we will not stay with you during this time. 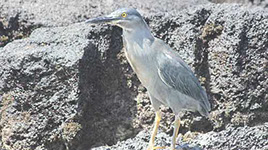 Distances are short in the Galapagos, and as the inhabited settlements have few residents they are very safe to walk around any time of day with normal precaution. The Guide activities start and end with the excursions. The guide will not go with you on the speedboats transfer either. -PUBLIC SPEEDBOATS: We recommend that before beginning the ride between islands that you take a seasickness pill if you are sensitive to sea-sickness. It is also recommended that you carry on small plastic bags in case of seasickness. The speedboats are not completely covered so please make sure that valuables and electronics, or anything that you do not wish to get wet, is stored in a plastic bag. The guide will not go with you on the speedboats but a new guide will greet you on the other side. There are no services onboard the speedboat as space is limited and the journey is relatively short. A water taxi ride is sometimes required (depending on the tide) from the dock to the speedboat, the cost is 1 USD per person and per ride. Please, make sure you bring cash in small denominations in case this expense is needed. -SCHEDULE OF EXCURSIONS: The schedule of the excursions will be coordinated and determined locally through the guide and those responsible for the operations. The guide will indicate what time each activity will start. The transfers between islands on the public speedboats are the only activities that have fixed departure times.